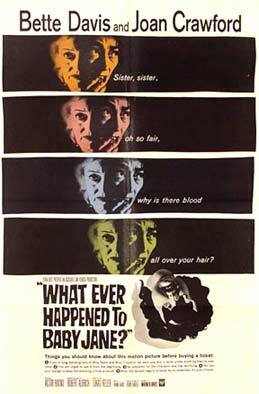 Beginning with one of the best pre-title sequences in classic film history, What Ever Happened To Baby Jane? shows the psychological genesis of the two ladies we see in the film, portrayed ever so perfectly by Bette Davis and Joan Crawford. We see a somewhat grotesquely perfect young child star who is celebrated and indulged to the extent where she has already lost touch with reality, and we see a sister who is caught in the middle, always in her sister’s shadow, and who vows never to forget it. This set-up is so perfect, as it primes us for the horrors to come, which arise as an almost direct result of the pair’s early childhood experiences and the development of maladaptive ways of viewing the world. These two ladies are distinctly past-focused; they ruminate on times gone by and fight over ruptures of the past that can’t be repaired, which reminded me quite a bit of the Beale ladies of Grey Gardens (1975) fame. Part of the disturbing nature of the film is the idea that these women have clung to grudges to a severe degree, resulting in some of their more disturbing behaviours (and there are some pretty disturbing moments in the film, to be sure). 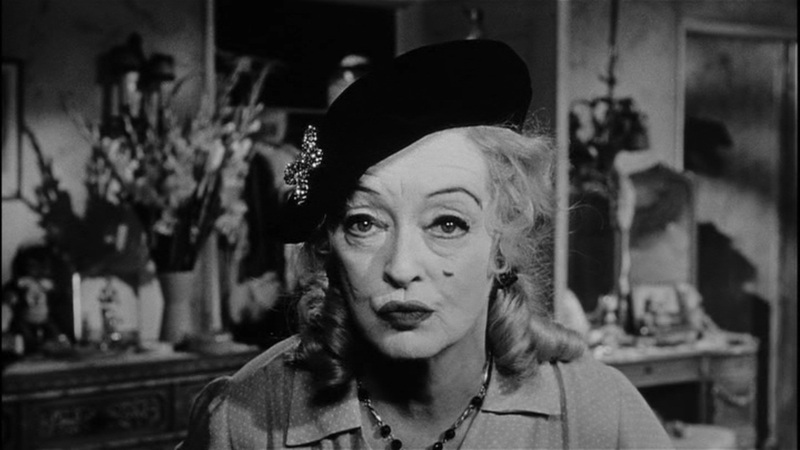 Baby Jane Hudson is not quite right, and Bette Davis’ performance is so frightening – the regressed, childlike appearance combined with her advanced age and downright nasty behaviour is a confusing and distressing sight. 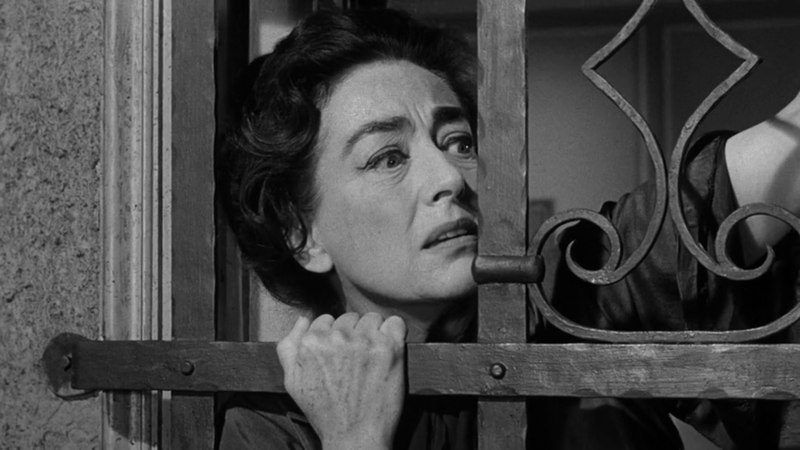 Joan Crawford provides some respite to Davis’ repulsive appearance in her elegant and subdued performance as Blanche, the sister who found her own limelight but was ultimately struck down. 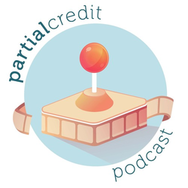 Crawford’s performance is authentically desperate (in a good way); Blanche is genuinely scared of her sister, and wants things to be set right. The problem with wanting things to be “fixed” in this circumstance, is that people like Jane are difficult to treat. Watching Blanche and Jane interact is like a game of cat and mouse with your emotions – Jane is so manipulative, but Blanche wants to see the best in her and wants her to get better. Watching Bette Davis and Joan Crawford interact in this way, and knowing somewhat of the history between the two actresses, is such a treat. The direction by Robert Aldrich is perfect, with scenes that emulate the classic Alfred Hitchcock technique of showing us a threat before it slaps us in the face. Aldrich masters the horror on display in a subtle manner. There are a few jump scares, but apart from those, what pervades is a sense of tension and threat throughout. I was very impressed with the cinematography by Ernest Haller, whose use of light and shadow perfectly underscored Aldrich’s tense direction. Meanwhile, music by Frank DeVol was the perfect accompaniment to the rest of the production, using riffs from Baby Jane’s popular song “I’ve Written A Letter To Daddy”. Hearing the singsong tune of this extremely child-like song in combination with the disturbing behaviour on display and the general sense of threat in the film, is a strange and harrowing experience. What Ever Happened To Baby Jane? is one of those classic films that has to be seen at least once. Not just for the final climactic scene which subverts a lot of your perceptions from throughout the rest of the film, but to also bask in the sheer magnetism of the performances by Bette Davis and Joan Crawford. It’s a story about fame found and lost, about women who are stuck in the past, who experience an extreme degree of sibling rivalry turned deadly. You’ll also feel like you need to have a serious think about life for about ten minutes after the film ends. The feeling following the conclusion of this film is one of serious worry and disturbance. But it’s all worth it. Highly recommended. Great review Anna, of a very disturbing and well acted thriller. Davis and Crawford knock it out the park. Thanks heaps Vinnie! Such a classic film. I love how their animosity off-screen was confronted on-screen. They really went at each other didn’t they? A fantastic classic. Nice review, Anna! Thanks heaps! It’s such a creepy film! I’ve not actually seen this but really want to now! Step to it Mikey! This one is so great. Agreed. This is a film that ought to be seen at least once, and it really does make you think seriously about life after it’s over. Great review! You really did justice to this remarkable film. Thanks heaps! 🙂 Such an amazing film that I’m sure will get even better upon further rewatches.